Are you an amateur footballer seeking the right exposure and opportunities for your talent? If yes, then the opportunity is here again. 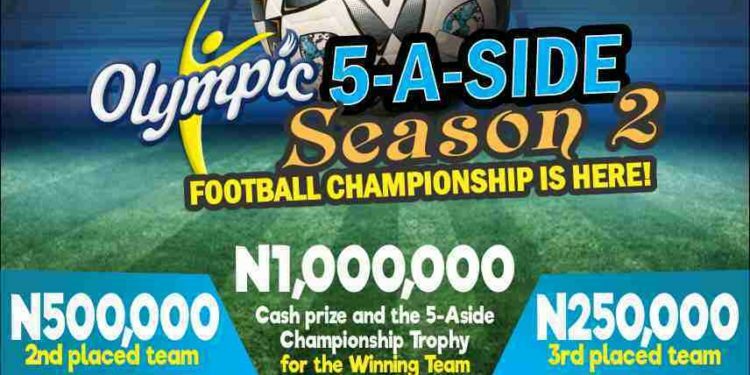 Registration for the second edition of the Olympic Milk 5-A-side Football Competition has kicked off. 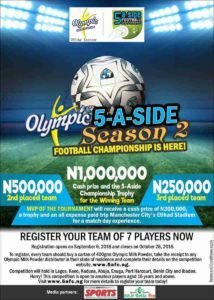 All you need to do to be a part of the 5-A-Side competition is to purchase one carton of 400gm of Olympic Milk powder, take your receipt to any Olympic Milk powder distributor in your state of residence and complete your registration online atwww.5afc.ng/register before the deadline on Friday, October 28, 2016. The registration is open to 16 year olds and above. The competition will hold in Lagos, Kano, Kaduna, Abuja, Enugu, Port Harcourt, Benin City and Ibadan. The teams that finish between first and third at the end of the tournament will pocket a whooping sum of N1.75 million. Winning teams from each city will be invited to Lagos for the qualifiers at the end of which the first, second and third positions will be rewarded with the sums of N1million, N500,000 and N250,000, respectively. The overall winner of the competition will go home with a cash prize of N1m and a trophy, while the second and third placed teams will earn N500,000 and N250,000 respectively. Last year, the premium milk brand was able to engage 2,500 youths across six cities around the country, with De Royal FC of Lagos crowned the champions. Media partners for the competition are Complete Sports and Sports Radio 88.9 Brilla FM. 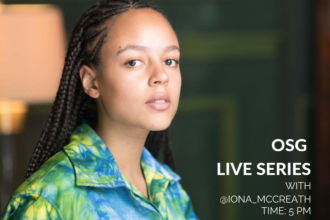 OSG LIVE WITH IONA MCCREATH.